Two of America's most popular authorities on healthy eating and cooking join forces in this delectable, inspiring and easy-to-use cookbook. Dr Andrew Weil - author of the best-selling Eating Well For Optimum Health - brings to this collaboration a comprehensive philosophy of nutrition grounded in science. Rosie Daley - acclaimed for her best-seller In The Kitchen With Rosie - brings to it her innovative and delicious spa cuisine. 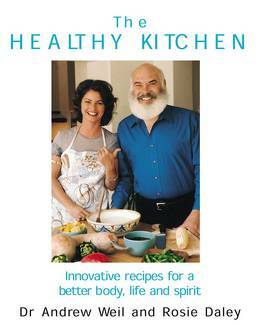 Lifelong good health begins in the kitchen, so this is a lifestyle book as well as a cookbook. But throughout, The Healthy Kitchen emphasizes the pleasure of food - in the writing, in the anecdotes, in the commentaries, in the superb photography (including pictures of the authors at work from garden to table) and in the recipes themselves. With 135 fabulous recipes and invaluable information on what constitutes genuinely healthy eating today, this revolutionary book will change the way you cook for yourself and your family forever.